It was a year ago today that our good friend Sweet Praline left us. Thanks to the beautiful Praline, I have my forever home. You see, Sweet Pea and Gabriel's Daddy thought that Praline was the most beautiful cat he had ever seen, and when he said he wanted a new friend for Sweet Pea, Mommy started browsing PetFinder to find the perfect match for her. She saw me and thought there was an uncanny resemblance to Praline and asked if she could foster me. Of course, once she had me, she couldn't let me go (not even to Sweet Pea's Daddy), and the rest is history. 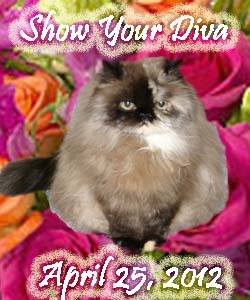 Some physical similarities aren't the only thing I have in common with Sweet Praline - I am also a diva! I want things my way and there is no compromising. After Mommy so cruelly had me shaved for the second time in as many years, I demanded to sleep on the bed under the covers at all times. Mommy noticed that when she would get into bed I would leave, so because she was worried I was maybe cold without all my furs, she slept on the couch for 2 weeks! Find another place to sleep - this bed is occupied! It could have been because she felt guilty or because of the dirty looks I gave her, but in the end I got my way. A queen-sized bed for a pint-sized diva! Praline, we miss and think of you every day! Mom Paula, you are in our thoughts. We love you! The humans don't know my exact day of birth, but they estimated it was on or around April 15th and I wanted to wait to post until today so I could do my very first ManCAT Monday post. Sweet Pea and I don't get treats because Daddy is moving us over to a raw diet, but we celebrated with a big bowl of bloody chicken organs and muscle meat. It was wonderful! I've grown so much! I'm a lean, muscular 10 pounds. In case you forgot how small I was, here is a photo of me as a kitten. And because The Monkeys' Mommy can't resist, here's another one! Now I can barely fit my huge body in that same cat bed. Hopefully by next year I'll be even bigger!